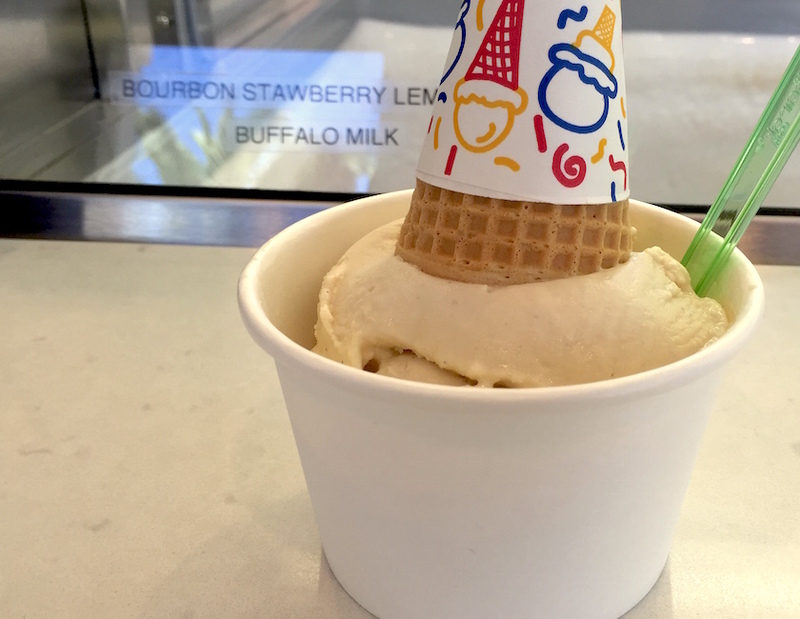 First things first: Buffalo Milk ice cream at Catalina Island’s new Descanso Fresh cafe is not made with milk from the buffalo roaming Catalina Island. Just like the drink that’s served at just about every watering hole and restaurant in Avalon and Two Harbors, it’s made with regular cow’s milk, a little cream, vodka, Crème de Cacao, bananas and a touch of nutmeg. Everyone has their own version of the cocktail—some even put ice cream in it before blending—but this is the first place to offer it in spiked scoopable form. Buffalo Milk, the drink, was conceived during a boring winter in Two Harbors, the smaller of two towns on the island, and the least likely one you’ll visit unless you have a boat. The story goes that a bartender at the Harbor Reef Restaurant, one of two restaurants in town, started fussing around with the booze at hand and combined vodka, Crème de Cacao, Kahlua, Crème de Banana and some half and half in a blender. That’s a tasty combo—obviously—but a heady one. It’s sweet, creamy, frothy and goes down way too easily. Blended like a milkshake and topped with whipped cream, it tastes like dessert. You really shouldn’t have more than one, but you probably will. Now just about every restaurant and watering hole in Avalon serves Buffalo Milk, some made with milk instead of half and half; some made with real banana, while others stick with the sweet liqueur. But no one serves a version that you can walk around Avalon with (it’s technically not legal to walk around with booze). Sitting atop a sugar cone or in a cup with a spoon, or in our case, both, you can get a little tipsy while parading down along the harbor. Fun! The new 21 & Up ice cream menu is just one new discovery this summer on the island. Situated in the Descanso Beach Club, adjacent to the dining area and bar, Descanso Fresh serves espresso drinks, ice creams and milkshakes to sandy beachgoers. It’s a great place to hit after lunch and some beach time. The club is open to the public, but you’ll be charged $2 a person to beach there; entry is free if you’re just eating and drinking. The result: deliciously innocent and boozy all at the same time. There are also non-alcoholic ice creams at the shop, including the super fun Salty Garibaldi, a blue-tinted salted caramel ice cream with orange-colored nonpareils mixed in. It’s meant to look like the big orange fish you see in the water along the shore all over the island. Get the ice creams, priced a $4.50 for one scoop to $7.50 for three, at Descanso Fresh throughout the summer and most likely into the shoulder seasons. And like the Catalina Express boat ride, you can even get a free scoop for your birthday, though the spiked ice creams are excluded.